The QSE approach is central to the BOVIS Group management. Through this approach, we strive for continuous improvement in the quality and safety of our services. The company has given itself the means to achieve this through a Quality Manager, Training Manager and a Safety and Environmental Manager who work daily within the Group and its branches. The BOVIS Group promotes management by Quality. We have been committed to a quality approach for many years. This approach has been successful in obtaining the ISO 9001 Quality Certification for a dozen of our branches. 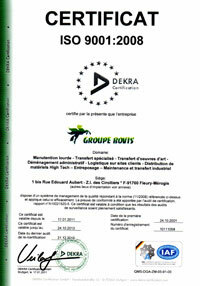 achievement of the OHSAS 18001 or MASE Safety Certification for many of our branches. For several years the BOVIS Company has aimed at respecting the environment. To this end, it has implemented several activities on sites and undertakes to extend them to all of its activities. 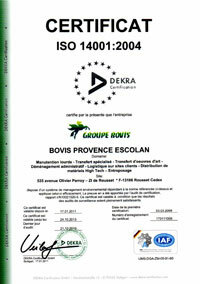 The BOVIS Company hopes to contribute by means of this practice to the protection of the environment, by emphasizing these approaches to obtain the ISO 14001 Environmental Certification. 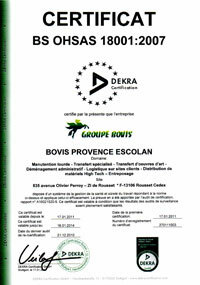 In October 2008, the BOVIS Provence Escolan, located in Rousset (13) was the first BOVIS Group branch to achieve an ISO 14001 certification.